Editor-in-chief of RIA Novosti Ukraina Kirill Vyshinsky said at an appeals court hearing in Kherson region on Friday that he was going to withdraw from Ukrainian citizenship and appealed to Russian President Vladimir Putin for protection, the news outlet Hromadske said. "I appeal to President Poroshenko whom I know in personal and whom we have done some good deeds seeds. I declare withdrawal from Ukrainian citizenship - from that moment I consider myself only a citizen of the Russian Federation. 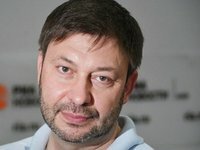 I ask President Putin to provide me with legal protection and adoption measures for my release," Vyshinsky said.